Our spaces are all fitted with technical equipment at an excellent specification for the size and type of space. For full details of what is provided, see the information page for each space. During your preparations for the festival our technical team will work with you to identify your technical requirements and ensure that they are suitable for your space. Where you have specific requests beyond our standard package, we are happy for you to bring your own equipment or to help source equipment on your behalf. When you first arrive at the venue for your “fit-up” slot we will allocate a technician to work exclusively with you during this period to ensure that everything is set up as you require. They will also take notes so that this setup can be replicated throughout your run. 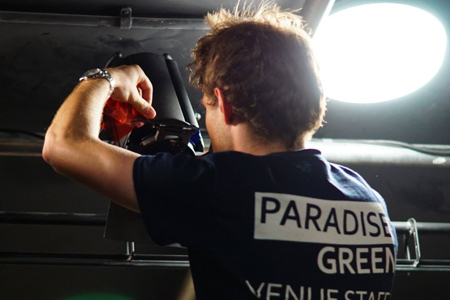 Our technicians will also be on hand before and after every performance to ensure a smooth changeover and correct set-up. We don’t normally provide show operators to actually run the show - we ask companies to provide this for the duration of their run. We can arrange for one of our technicians to act as a show operator for an additional charge. Each show has a "fit up slot" prior to the first performance. This is when you get your set into the space, focus and plot lighting, prepare sound and projection. The date of each shows fit up is included in our formal offer and typically takes place on a "dark day" (when no performances take place). Fit ups are allocated by Paradise Green throughout the day - some of the slots will take place at unsociable hours. For Weeks 2 and 3 fit ups will be on the Sunday immediately preceding the run. For week 1 they will normally be on Thursday 2nd or Friday 3rd August. We will try to accommodate any special requests, but these must be communicated to us in advance of the slots being allocated. Companies must check the date and time of their fit up slot before finalising travel and accommodation arrangements as we have very little time in which to fit all the fit ups and hence little or no scope to work around additional constraints which we are not aware of in advance. The length of the fit up will be the same as a normal performance slot (but may be at a different time as per the above). I.e. if your show is 60mins with 20mins get in and out then your fit up slot will be 100mins. The time is tight and companies should plan ahead how this time may best be used. There is typically time to complete the technical set up, but not to do a full technical or dress rehearsal. Companies with a complicated technical set up, or those wishing to rehearse, can consider paying for additional time. We offer discounted rates for requests made by May 31. Equipment provided by company has been certified PAT safe. Each performing company must provide a technician to operate each performance. The technician must remain at the technical desk and emergency phone throughout each performance in case of any problems. If you need to hire a technician then we can normally provide a member of our team to act as Show Operator. We operate on a first-come-first-served approach with competitive rates and a discount for requests made before May 31. Please contact info@paradise-green.co.uk for more information. What will your Show Operator do? The Show Operator is a member of our technical team who will be available to operate each of your performances. You will normally have the same person for each show, although we sometimes change Show Operators each week or for operational reasons (e.g. sickness). The Show Operator will attend your Fit Up and learn the show. They are familiar with our technical equipment and will support you with lighting, sound and projection. 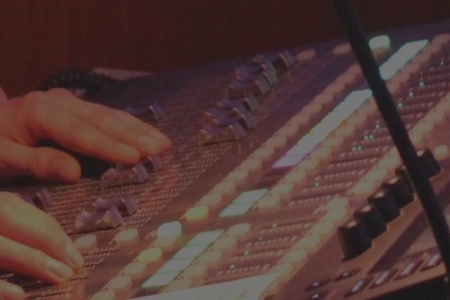 For shows with complicated technical requirements you may need to hire a separate Show Operator for each role. 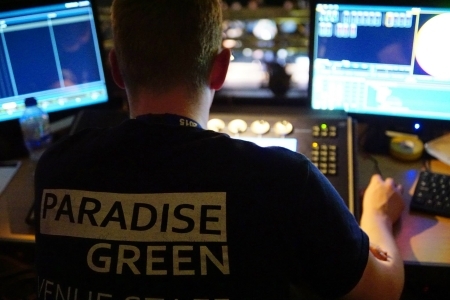 You are still responsible for designing and preparing the technical aspects of your show. This means that you should design your lighting and acquire any music/sound effects etc that you would like to use. You will need to provide an annotated script or cue sheet for the Show Operator to follow.